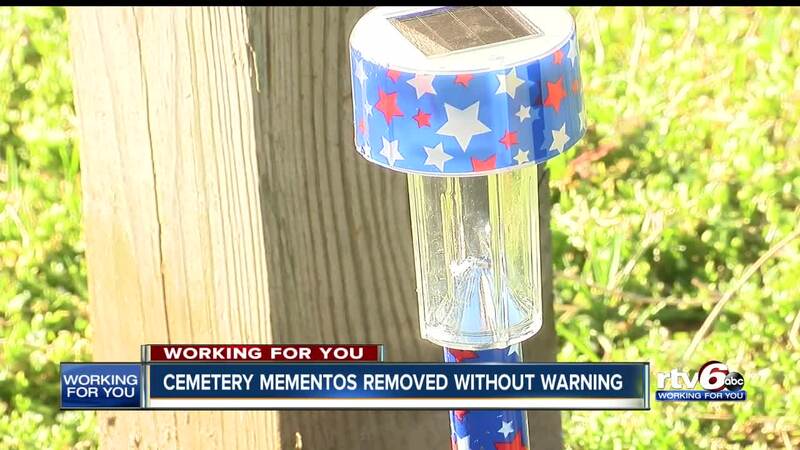 MARTINSVILLE — Priceless mementos are now in a Martinsville dump after the caretakers of South Park Cemetery removed memorials from gravesites last week. The cemetery's caretakers contend the mementos violated cemetery rules, but emotional family members said their loved ones' graves were desecrated without warning. A gravestone is a representation of love lost. We leave items at the gravesites of our loved ones because they mattered to them when they were alive. Jennifer Pizer's son, Marco, took his own life in 2016. She placed lights on his grave so he would never be in the dark again, but just a day removed from the 3-year anniversary of his death, she found his gravesite disrupted. His shepherd hook was gone, and all his lights, except one, were removed. "Now he's left in the dark again where he doesn't belong," Pizer said. It happened to Lori Ann Vandeventer's grave, too, which her husband, Chris, has tended to since she passed away. "I've never let this grave sit empty," Vandeventer said. "This is the first time it's ever been bare. I still feel like I have to protect her, even when she's here." For Vandeventer, leaving flowers at Lori Ann's grave reminds him of what she liked and disliked. "Whatever I do, I never put sunflowers because she hated sunflowers," he said. A spokeswoman for Hartley and Son's Monuments said they removed items from gravesites around the cemetery saying it was part of their posted rules and spring cleaning. Family members, though, said they were shocked and couldn't believe it happened. "She never said a bad word to anybody and it just bothers me that she's been treated this way," Vandeventer said. Lesley Andrews father-in-law, Specialist Willie Andrews, had a cross with an American flag removed from his grave. Everyone we talked to said they know their memories won't be replaced, but Andrews has an idea before another cemetery cleaning happens. "Maybe send out letters or post an article in a paper or at the cemetery," he said. The spokeswoman for the caretakers said they do these spring cleanings every year. We'll follow up and see if they plan to change their policy to alert people next time before they happen.